I know I need to upgrade to WordPress 1.5. I’ve been dragging my feet because I’ll have to turn all of my skins into “themes,” and I need to do some research on how to do that. I don’t want to use the default theme, because I don’t want to look like every other WP1.5 blog out there. Kubrick is very nice and all, but I like to be different. And, yes, I know that some people find my default skin a little… garish, shall we say? But that’s why I have other ones available. If you don’t like green, orange and blue, just pick a different one. There’s even one that’s black & white. So, if you see things get whacked around here all of a sudden, you’ll know that I finally made the plunge. I thought I’d create something for them to find. So here is a sample that I knitted up a while ago, but didn’t get around to posting. It’s not blocked, so it’s not straight. But at least you can get the idea. 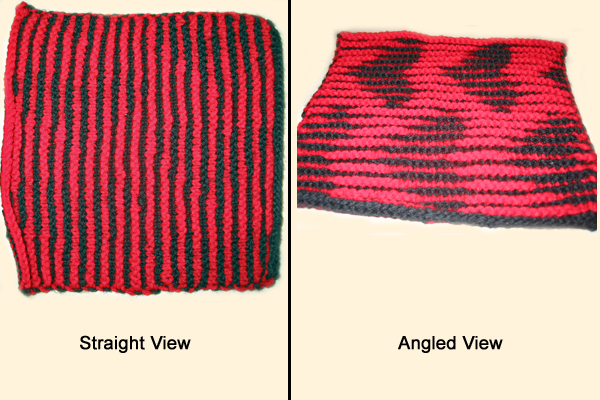 From a straight-on view, it appears to be just a simple striped knit. There’s a subtle red heart pattern that’s hard to see in this picture. But from an angled side view, the black hearts suddenly appear. As always, clicking on the picture will get you the bigger version. Now… back to the socks. They tell me that things always comes in threes. This is three. That’s enough now. It’s been cold in my cube at work. Really cold. I’ve asked the building services people several times to see if they can warm me up a bit, but so far no go. Friday I was freezing. When I found myself pouring a cup of tea for the sole purpose of warming up my hands so I could type, I realized I needed to do something! And, being a knitter, I knew the perfect thing to do. Friday lunch break was spent at the Yarn Garden, picking up a skein of Regia 4-ply mini ringel color # 5220. 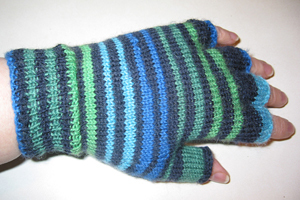 And this weekend I made fingerless gloves. You can see the results at right. Click on the picture for the bigger version. Yes, I made two. And yes, I matched the stripes. And, yes, my cube is plenty warm today, so I don’t really need these. 😆 But I think they make quite a fashion statement! I also had a big, big jones for 90-minute Beer Bread. It’s a yeast-bread recipe that really does take only 90 minutes and results in a yummy, hearty bread that’s perfect with soups, stews and chilis. It also takes a bottle of beer — or, rather, it takes a partial bottle of beer (the rest goes in the cook!). I usually use ale, but all that was in the fridge was a bottle of MacTarnahan’s Blackwatch Cream Porter. It was the best batch of Beer Bread I’ve ever made! From now on, Porter it is! Click on the link below for the recipe. I served mine this weekend with a vegetarian chili. The recipe makes 1 loaf, but I always double it and make two loaves so I can freeze one to have on hand. Mix 1-1/2 C white flour and rye flour. Heat beer, honey and butter until warm. Dissolve yeast in warm water in large warm bowl. Add warm beer mixture, caraway seed, salt, garlic powder and 1-1/2 cups flour mixture. Beat until smooth. Stir in remaining flour mixture and enough additional white flour to make a soft dough. On a floured board, knead until smooth, about 4 minutes. Shape into a ball. Place in a greased 8-inch round pan, turning to grease top. Flatten to fit pan. Cover. Let rise in warm, draft-free place 45 minutes. Bake at 375 degrees F for 25 to 30 minutes, or until done. Remove from pan. Brush with additional butter or margarine if desired. Cool on rack. When at work, I park in a big, multi-story lot — the kind where you drive up an endless oval ramp in search of a place to slot your vehicle. Some of the turns are tight. Yesterday I followed a guy in a brand new Audi A6 up the ramp. The whole way he had a cell phone stuck in his ear. Since he was holding the phone with one hand and steering with the other hand, he had a bit of trouble making some of those turns. He kept slowing to a stop. He was laughing as he finally parked. I wasn’t amused. Now, maybe it’s just me… but shouldn’t a car that costs somewhere around $45K have a hands-free option? Two days of massive spring cleaning! The house feels so much lighter, now. The big news is that #1 Son’s room no longer resembles a toxic waste dump. I can actually venture inside without fearing for my life! The transition is truly amazing. Monday we cleaned from stem to stern. Tuesday we cleaned and sorted, and took junk to the landfill, recycling to the transfer station, and donations to the appropriate places. There are still things that need to be delivered, but I can get a car in the garage again. And the best thing about this venture? It was #1 Son’s idea! After the initial shock wore off (who are you, and what have you done with my son? ), I decided to go with the flow. And I’m glad I did. I have today as a vacation day, also, as I wasn’t sure how long the cleaning would take. Today I’m knitting. Maybe I’ll finally get somewhere on those socks!